So, I start getting people following me based on my expertise (e-Commerce in this case). What am I to do? I always check them out and see what’s in it for me. 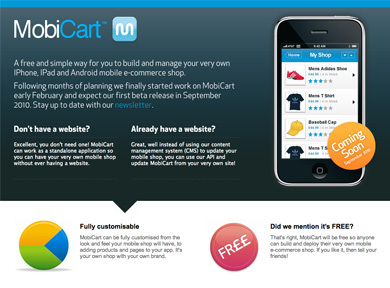 This morning I got a follow from @mobicart and I went to check them out. First I looked at their Twitter stream. Wasn’t that interesting, so I decided not to follow them. I didn’t want to ignore them so I looked up their site. They make mobile commerce apps and they’re based in Newcastle, so that makes them more interesting straight away. They have a great looking site and so I’m intrigued even further. Their site made it really easy to subscribe – no nonsense, probably based on their experience with making useful interfaces for mobiles. So now I’m connected to them. Not by Twitter, but by email – an infinitely more powerful information tool that allows them to track whether I actually look at what they broadcast. So, based on this, do you follow people to get a contact? Is it a legitimate way of building your email marketing list? What do you want people to do when you follow them?